Get that kindling out of my face. This is (‘tis) the season for wondering where the hell the time went and how you’re ever going to get everything you need to get done before Christmas. And when it comes to picking that perfect Christmas tree, the sooner you get your act together, the better. No one wants to pick through the dried out dregs of Christmas trees still on the lot in mid-December. Fortunately, you have options for fresh, environmentally friendly Christmas trees that will look great right through the new year. Here’s how to pick the right one. Want your tree guaranteed super-fresh? Head to a farm where you can pick your tree and cut it down, or have it cut down, yourself. Most u-cut farms open around Thanksgiving, and the sooner you go, the more trees you will have to pick from. Because you know you’re getting the freshest tree, you can be assured that it will last through the holiday season so long as you keep it watered. If you get it home and in its stand within a few hours of it getting cut, there’s no need to resaw the stump. That Christmas tree shape doesn't come naturally. This is also a very environmentally friendly option, especially if the tree farm is close to you, or if you would have used the gas for a Saturday outing anyhow. The largest inputs will be agricultural inputs — water, fertilizer, pesticides — that the farm may use to enhance tree growth. Ask your farm about their policies, or go organic, if you want to be extra safe. If you want the freshness of a u-cut tree without the hassle, many tree farms offer home delivery options. This will come at a premium price, but it is also the easiest way to get the top quality product. Many Christmas tree farms set aside the best trees for this service, and will hand-pick a tree to your specifications when you order, but only cut and ship it at the time you specify. It will take a couple days to get to you, so remember to saw off at least a half inch of the trunk before putting the tree in its stand. It should still stay fresh for at least a month. From an environmental perspective, having trees shipped could offer efficiencies over going to pick up the tree yourself, since multiple trees would be delivered in a single trip. But consider how far the tree will be shipped — flying your tree across the country will more than negate those small efficiencies. Most Christmas trees are sold off lots, and this isn’t a terrible way to go. There can be efficiency in bringing trees in bulk to a central location that can service many customers. These will not be as fresh — you’ll want to buy as soon as they go on sale, since the trees will hold up better in water in your home than slowly drying out in a parking lot somewhere. If you can’t get out to the lot right away, ask if there are any fresher trees available, and check for signs of dead or dying needles. Buying plastic trees made of oil might seem like the worst thing you can do for the environment, though that’s not always the case. One study found that if you keep an artificial tree for 20 years, its lifetime emissions will be less than buying a real tree each of those years. So if an artificial tree fits your lifestyle, the best thing you can do is pick a high- quality product and commit to maintaining it for a lifetime of use. Also consider if the tree is made from recycled materials — and of course when it does come time to get rid of it, be sure to investigate options for recycling. You can't beat that evergreen smell at Christmastime. If you live near an evergreen forest, there’s a good chance there will be somewhere that you can legally go and cut your own wild tree. This is a great option for the environment, designated areas tend to be places that need to be cleared anyhow, like highway right of ways. Don’t go this route if you demand a full and bushy tree, though. 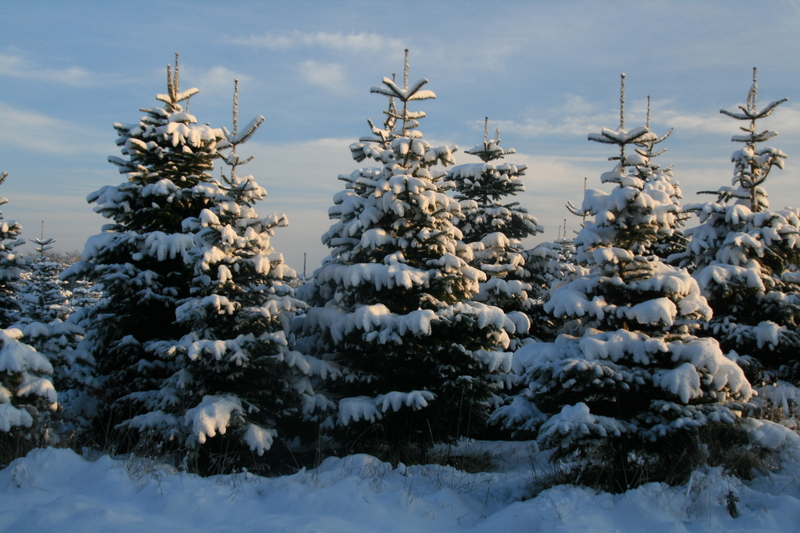 Farmed Christmas trees look the way they do because they are carefully pruned and cultivated, preventing upward growth in favor of outward growth. You won’t find these conditions in the wild, so expect to find a lot of too tall, too skinny, too bare options. You can console yourself with the knowledge that you have the real, real deal. If you’ve got some land and several years on your hands, you might consider starting your own little Christmas tree plantation. This route is actually carbon-negative, since planting trees where there otherwise would be none will sequester carbon from the atmosphere over time. Pick a species native to your area and plant either in outside pots or directly in the soil. Potted evergreens can be brought inside and decorated for Christmas, but only for a few days at a time. Otherwise your tree will think it’s spring and won’t be able to handle the cold shock when you take it back outside. These can be reused year after year until they are too big for pots or your home, at which point they should be transplanted and retired to a permanent spot where they can grow and release oxygen for decades to come. If you want to keep your potted tree indoors year-round, pick a species that thrives in warm weather, like the Norfolk Island Pine. Then you’ll have Christmas in July, and every other month. Both potted and planted evergreens can be pruned from the top after a couple years to encourage bushiness. Your planted trees will be ready for harvest after about five years if you want to bring them inside. After Christmas, look into local recycling options — often dead trees can be turned into mulch or biofuel — or chop up for firewood. In the last few years businesses have popped up around the country that will rent you a tree for the Christmas season. It typically works like this: You get a potted evergreen for up to a few weeks and the company deals with delivery and pickup. The same trees can be rented out again and again, until they grow out of their pots and are cut, then rented out one final time before being recycled into mulch or biofuel. These services tend to be expensive, but they get points for environmental friendliness, freshness, and convenience — if there happens to be one in your local area.